Who is Kathy Vincent, The Scripture Lady? Children’s ministry expert, Kathy Vincent, also known as The Scripture Lady, began her ministry, by the same name in 1995. For 12 years, at the beginning of the ministry, she trained and directed various groups of home schooled children with ages ranging from Kindergarten to Jr. High. She directed these children to perform Bible verse songs, which she had written. Through thematic programs completely centered on Scripture, the children and Kathy would go to local churches and private Christian schools and perform her musical Bible programs. It was an amazing time to be able to watch these children grow in their confidence and relationship with the Lord. It was equally a blessing to be able to go into the smaller bodies of Christ and minister to their children in creative ways to help them get excited about God’s wonderful Word. God has used Kathy and her children’s ministry to share His Gospel to thousands of children over almost 2 decades throughout Southern and Northern California. He has given her several thematic Bible programs for both the preschool and elementary ages, which she’s been blessed to share, all with the goal to help get kids excited about the Bible. 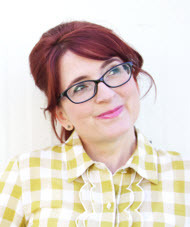 Her programs are a multimedia experience using the creativity and inventiveness of our times. They are all meant to engage the child in God’s life-changing Word and spur him or her onto a love for the Bible. 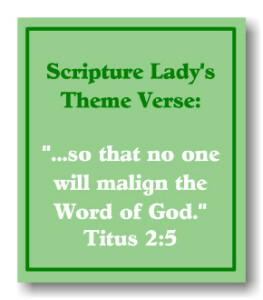 The Scripture Lady is not affiliated with any particular denomination but holds to an evangelical Christian theology. You can view her statement of faith here. 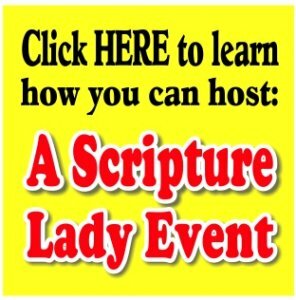 What Is The Mission of ScriptureLady.com? The mission of ScriptureLady.com is to provide Christian children’s workers and ministries with creative ways to teach the Bible to the children they serve. We desire to train teachers so they can effectively teach their children about God and His amazing life-changing Word so that lives may be eternally transformed. At ScriptureLady.com, you will find hundreds of children’s ministry resources to help you get your kids excited about the Bible. Our many resources include toe-tapping Bible verse songs for easy memorization, Bible review games which are like a sermon and game all rolled into one, Bible object lessons and many other Bible activities for the spiritual growth of your children. 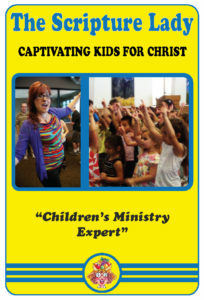 In addition to helpful resources, Kathy Vincent, The Scripture Lady travels around to churches and schools, mainly in the counties of Orange, Los Angeles, San Diego, and San Bernardino, and performs educational, Scripture-filled, musical Bible programs designed to get your kids applauding the Word of God. She offers programs for the preschool, elementary school, Sunday School, and special needs ministry. Kathy also offers effective teacher training workshops to encourage the Christian children’s worker. Workshops are offered to those who teach preschool, elementary school, Sunday School and to those who work in special needs ministries.